On Wednesday his focus will be back to tennis, when he plays first-round match in New York Open at NYCB Live's Nassau Coliseum. 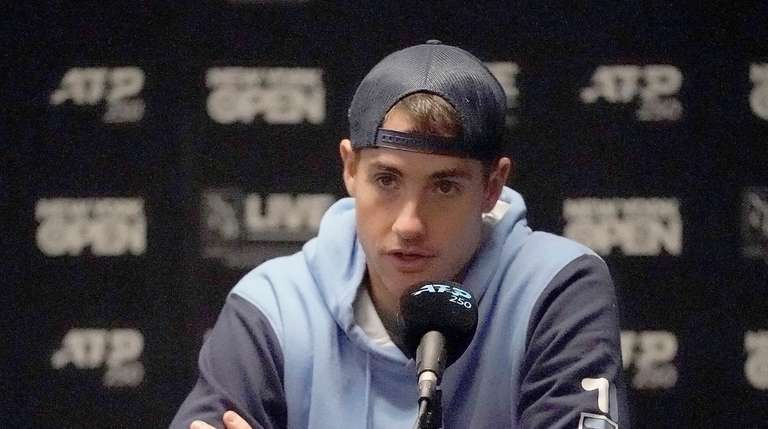 Although John Isner will be concentrating on winning his first match of the 2019 season at the New York Open, expect that he will be focusing during his down time on his favorite fantasy sport — hockey. He’s got Islander Josh Bailey on his team, but no Rangers. He took defenseman Neal Pionk at the start of the season but dropped him when he got injured. Isner has played two matches at the start of this season, losing in two sets to fellow American Taylor Fritz in the first round in Auckland and to another American, Reilly Opelka, in four sets at the Australian Open. All six sets were decided in tiebreaks. His first match at the Open at NYCB Live's Nassau Coliseum is Wednesday. He didn’t start off well last year, losing in the first round at the Australian Open then the first round of the inaugural New York Open. But he went on to have a stellar season, winning a top-tier event at Miami over Alexander Zverev, losing in the Wimbledon semifinals to Kevin Anderson, 26-24, in the fifth set (6 hours and 36 minutes), winning the Atlanta tournament and losing in the U.S. Open quarterfinals. Earning big points, he ascended to No. 9 in the world and he’s the No. 1 seed in the New York Open. He’s one of the older players in the game, and turns 34 in April. But age seems to be only a number among the tennis elite these days. “I’ve always played my best in the states, “ he said. “Unfortunately three or four years in a row I’ve started off the year pretty poorly in Australia. Can’t put my finger on why, but I ended the year pretty well. I’m eager to get back on the court." There’s some snow in the forecast, and that’s quite OK with Isner, a Dallas resident and year-long sun chaser as a pro tennis player.